The new activity region 1339 - a full-disk view of today and another close-up - is now crackling with M-class flares as it approaches the center of the disk. Just after arriving around the limb it had fired off an X-class flare ("Ein Flare der ...") on Nov. 3 that made some headlines but not another one - thus geophysical effects of AR 1339 have so far been absent. • Also some truly great aurora images (in the picture stream, both directions), the anatomy of a geomagnetic storm, a detailled report and 3 videos from the German outburst of Oct. 24/25 (also a Canadian view) and a solar cycle primer. Plus a paper on the solar corona and how and why visual and photographic impressions differ so much. Elsewhere in the Galaxy the Epsilon Aurigae eclipse is not completely over, with lingering spectroscopic effects; also the 9th campaign newsletter. And some recent images of M 101 and its fading supernovae; some science results (also about the one in M 51) can be found linked here. • Back in the solar system Venus & Mercury on Nov. 5th and Oct. 27, Jupiter's Io covering its shadow and unusual events around opposition (more, more and more). • An amateur non-detection (but great 2006 pics!) of the bright Uranus spot (more and more). • The full paper on Eris' diameter, a press release and yet more stories here, here and here. The most unusual event of the month - with few other highlights - is the close approach of the 400-meter asteroid 2005 YU55 which already being tracked with radar by Goldstone, supporting planned Herschel observations: more previews of the hard-to-observe event here, here, here, here (earlier), here, here, here, here, here, here, here, here and here. Also recordings of two related chats here and here and articles in German hier, hier and here, plus more media reax. 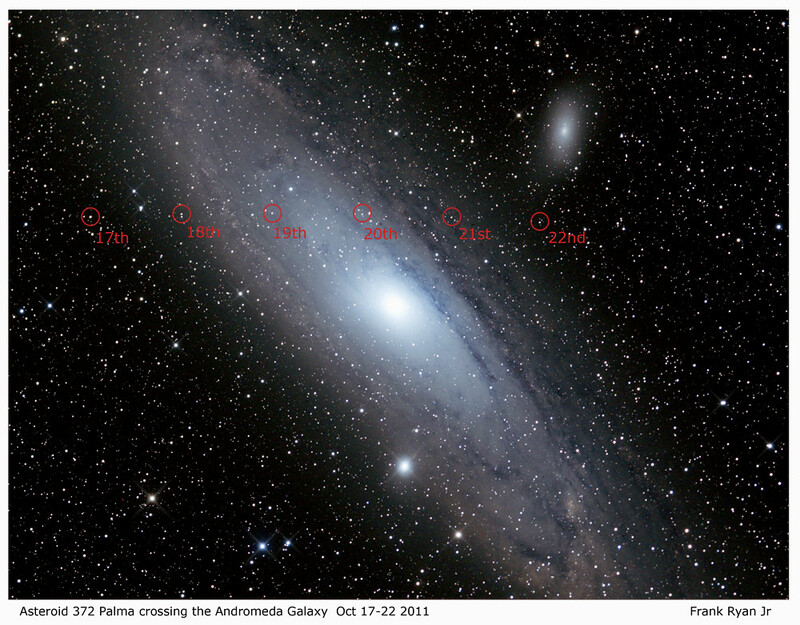 • Also La Palma crossing M 31 again, the stones from 2008 TC3 and a CBET on the Draconids, a rare visual observation and images of Nov. 1 (animated) and Oct. 27 (processed and explained), a looong rant about and Indonesian coverage of ex-Elenin - and Garradd on Oct. 30.